YouTube/Unbox Therapy Apple has indicated that customers suffering from bent iPhones will be able to return them to an Apple Store and receive a replacement device. In an online conversation with an Apple support employee, The Next Web asked whether a bent phone would be replaced for free. 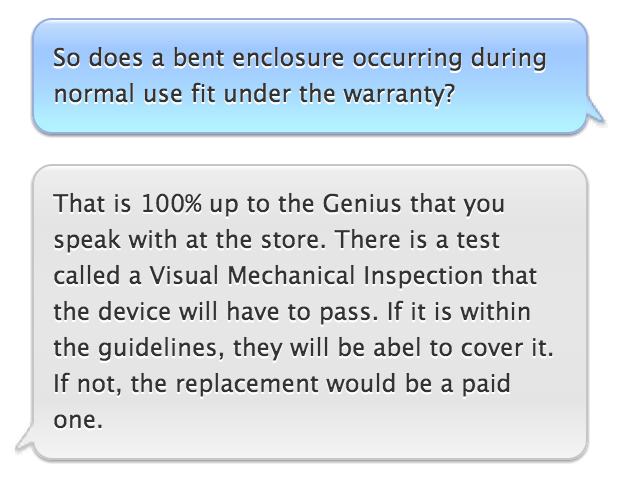 According to the Apple employee, Genius Bar employees will perform a "Visual Mechanical Inspection" on phones that customers claim to be bent. If an iPhone passes the official test, then Apple will give you a replacement. But this counts only if the phone was bent during normal use, such as sitting in your back pocket. If you've been intentionally flexing your phone, then you may be out of luck. Elsewhere in the conversation, the same Apple Support employee revealed just how seriously Apple is taking the crisis, which has been dubbed "#BendGate" by online commenters. The Apple employee said the company was "looking into this with an insane amount of detail."